While final numbers wouldn't be available until next week, DHS spokesman David Lapan said that about 118,000 of the roughly 154,000 people eligible for renewals had submitted their applications by mid-day Thursday. That left 36,000 — or about 23 percent of those eligible — outstanding. Facilities processing applications were prepared to accept courier deliveries until midnight, he said. 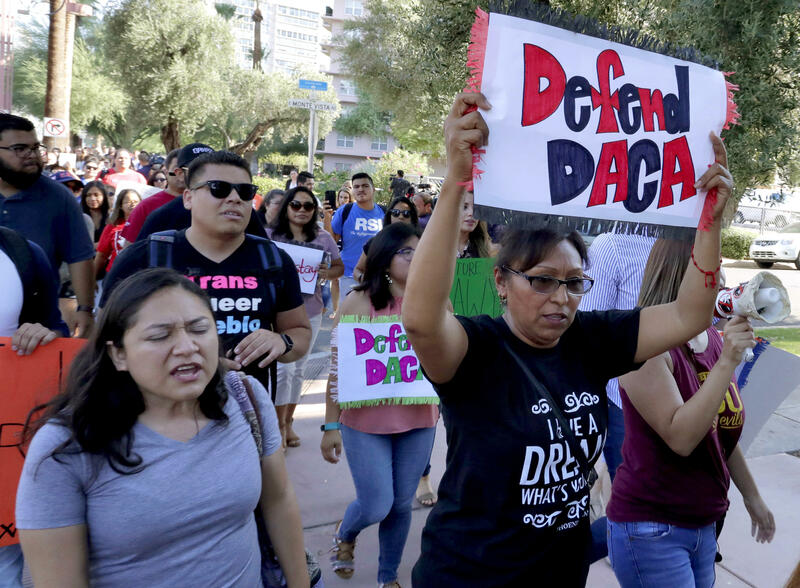 The deadline approached as the Trump administration finalized the details of a set of immigration principles that could upend efforts to come up with a permanent fix for DACA recipients, often known as "Dreamers." White House press secretary Sarah Huckabee Sanders declined to discuss specifics Thursday, but back in mid-September she said the list would likely include demanding an end to so-called sanctuary cities that refuse to share information with federal immigration authorities, funding for more immigration judges, and "supporting things like the RAISE Act" limiting legal immigration. "If the president winds up tying these elements to the DREAM Act," he said, Trump would wind up responsible "for deporting 800,000 young people, which pretty much nobody wants except Stephen Miller," Trump's hard-line senior policy adviser, who was working on the principles. Immigration advocates spent weeks trying to publicize Thursday's DACA deadline. Earlier this week, dozens of DACA recipients traveled to Washington to try to pressure members of Congress to vote on the Dream Act, which would provide an eventual path to citizenship. Sen. David Perdue, R-Ga., one of the authors of the RAISE Act, said, "Democrats really want a fix on DACA, and we really want a fix on the immigration system." "This is a landmark opportunity to fix the DACA problem and once and for all fix the vagaries of this immigration system that really doesn't work," he said. "With the deadline we have with DACA, I think it's unrealistic to think we can do broader immigration reform like that," he said. "I don't see that happening."